Most academic philosophers and intellectual historians are familiar with the major historical figures and intellectual movements coming out of Scotland in the 18th Century. These scholars are also familiar with the works of Immanuel Kant and his influence on Western thought. But with the exception of discussion examining David Hume’s influence on Kant’s epistemology, metaphysics, and moral theory, little attention has been paid to the influence of the Scottish Enlightenment thinkers on Kant’s philosophy. 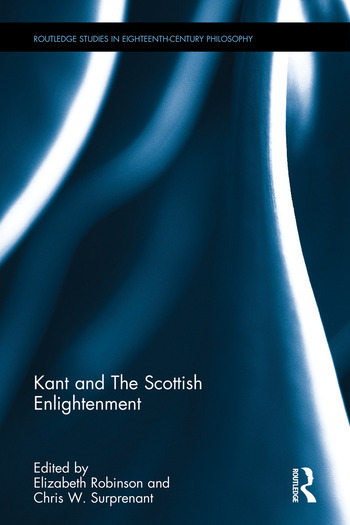 This volume aims to fill this perceived gap in the literature and provide a starting point for future discussions looking at the influence of Hume, Thomas Reid, Adam Smith, and other Scottish Enlightenment thinkers on Kant’s philosophy. Elizabeth Robinson is an assistant professor of philosophy at Nazareth College in Rochester, NY. Her research primarily considers early modern philosophy with a focus on Hume and Kant. Chris W. Surprenant is an associate professor of philosophy at the University of New Orleans, where he directs the Alexis de Tocqueville Project in Law, Liberty, and Morality. He is the author of Kant and the Cultivation of Virtue (Routledge 2014).